We hosted our inaugural patient conference which was an outstanding success. Our keynote presenters Dr Mignot and Julie Flygare were very informative and inspirational. A huge thank you to all our volunteers who helped make the weekend run so smoothly, and to all our members who travelled across the country to attend it, we hope you enjoyed it! Our founder Melissa Jose and her son Lucas appeared on Weekend Sunrise today. Here's the link for those that missed it. We have a new presentation to help your loved ones friends and colleagues to understand a little more about narcolepsy. Please share it. 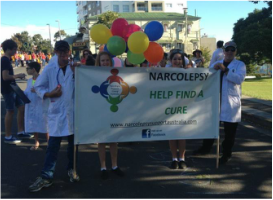 One of our members Roslyn has done a story on Narcolepsy in this weeks "That's Life!" magazine. Please check it out. Thanks Ros we think you're a star! Dee Daud is a true inspiration a man who is prepared to stand up and be counted. His tireless efforts to raise awareness of Narcolepsy and cataplexy through his you tube channel and TV interviews is truly amazing! THANK YOU DEE!! The Sunday Night Program airs on Channel 7 at 6:30pm This week the show features a story on Narcolepsy! Help Harrison White access "Modafinil" on the PBS. Make a difference to this little boy and his family! Harry is a 6 year old Australian boy suffering from the effects of Narcolepsy. He is unable to access the medication "Modafinil" under the Pharmaceutical Benefits Scheme (PBS). Read more about his story here. This year we are attending the Narcolepsy Network Conference in Cleveland Ohio. We are hoping to make some great new connections and attend many informative sessions....stay tuned for our updates.